I didn’t watch Mr. Show when it was first broadcast in the nineties, partially because I didn’t have cable and partially because I didn’t know what it was. Beth was a fan of it, though, and introduced me to the program through the DVDs. Since then, both David Cross and Bob Odenkirk have achieved notoriety through other media. David is on Arrested Development as well as other things (including the Alvin and the Chipmunks movie, which Bob mentioned in a recent bit on Jimmy Fallon), and I know Bob appears on Breaking Bad, although I haven’t actually watched that. Hey, I’m too involved with the Internet to devote time to television, okay? The two of them went on tour with much of their original cast on the Hooray for America! tour in 2002, and Beth and I attended that. 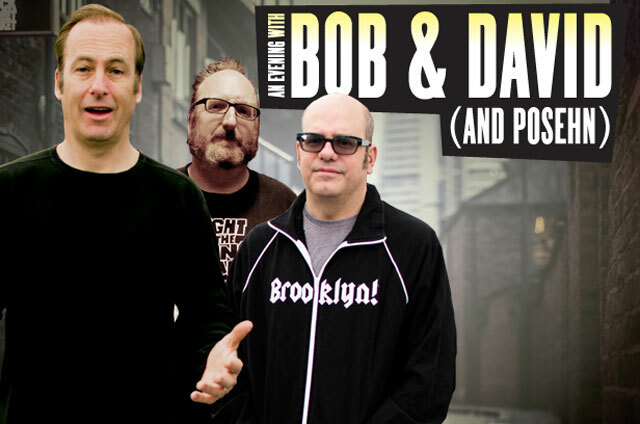 More recently, partially in order to promote their new book, Bob and David have gone on a brief tour, bringing along Mr. Show regular Brian Posehn, but with the rest of the cast being new (at least as far as I know). We saw them in New York, and while the 2002 tour had included some classic sketches, the ones this time looked to be all new. Well, there was a bit where they reenacted some old sketches badly on purpose, but that was the exception. In addition to the sketches, Bob, David, and Brian each did a brief stand-up segment. There was a question-and-answer session at the end of the show, and one of the topics that came up was how they always linked the Mr. Show sketches together. Bob pointed out how, when they couldn’t think of a link, they’d sometimes just have the ending line for one sketch appear on a sign or something at the beginning of the next one. Apparently some people actually considered those some of the better links. I’m not sure how common such links are in sketch comedy. I know Monty Python tended to use them, and also to do a lot of meta-humor on how hard it could be to come up with them. There’s a lot of Python influence on Mr. Show, but Beth likes the latter but not the former. I’m a fan of both, as I’m sure you’ve realized by now. Anyway, the live show proved that, even after all this time, Bob and David are both still hilarious and have good chemistry. Which in turn could be linked to Breaking Bad, GloboChem, or the fact that Bob’s brother has his doctorate in chemistry. This entry was posted in Arrested Development, Celebrities, Live Shows, Monty Python, Mr. Show, Television and tagged bill odenkirk, bob odenkirk, brian posehn, david cross, sketch comedy. Bookmark the permalink.